Dante Alighieri was born on May 29, 1265 into a prominent family of Florence. His father, Alighiero di Bellincione, remarried after his mother, Donna Bella delgi Abti, died when he was only 5 or 6. Alighiero then married Lapa di Chiarissimo Cialuffi and bore two children, Francesco and Tana. When Dante was only twelve, although quite common in this period, he married Gemma, daughter of Messer Manetto Donati. The couple had several sons, Jacopo, Pietro and Antonia, however many more claimed to be his children. 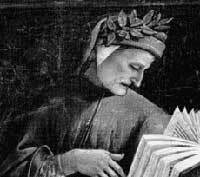 Although not much is said about Dante's education, it is believed that he was educated at home and studied Tuscan poetry. His interests led him to discover Provencal minstrels, poets and the Latin culture. At 18, Dante met Guido Cavalcanti, Lapo Gianni, Cino da Pistoia and Brunetto Latini. The five then became the leaders of Dolce Stil Nuovo, "The Sweet New Style". Brunetto was later mentioned in Divine Comedy for what he had taught Dante. Dante's other studies included music and painting. When Dante was younger, age nine, he met Beatrice Portinari, the daughter of Folco Portinari, and fell in love "at first sight" without even speaking with her. Later when Dante was 18, he often exchanged greetings with her on the street, but never knew her well. His love for Beatrice became his purpose for living and his poetry. After Beatrice's death in 1290, Dante tried to find a makeshift in Latin literature reading Boethius' De consolatione philosophiae and Cicero's De amicitia. Dante then dedicated himself to philosophical studies and took part in the disputes between Franciscan and Dominican orders describing the doctrines of the mystics and of San Bonaventura and the latter presenting Saint Thomas Aquinas' theories. Dante was also a soldier who fought in the battle of Campaldino on June 11, 1289 with fellow Florentine knights against Arezzo. In 1294, he also was among the knights who escorted Carlo Martello d'Anjou, son of Charles of Anjou, while he was in Florence. Dante was also a doctor and pharmacist due to a law issued in 1295 which required nobles who wanted to hold public office be enrolled in one of the Corporazioni di Arti e Mestieri. Dante took advantage of this by selling his books, because at this time books were sold from apothecaries' shops. As a politician though, he held only smaller offices over a number of years. Being engaged in politics at this time was hard, as Pope Boniface VIII was planning a military occupation of Florence. In 1301, Charles de Valois, brother of Philippe le Bel king of France, was to visit Florence because the Pope appointed him peacemaker for Tuscany, however the city's government had already treated the ambassadors before him badly. The city council instead sent a delegation to Rome to ascertain the Pope's intentions, Dante was the chief of the delegations. O Intelligence Moving the Third Heaven. From "The Banquet". La Vita Nuova. A 42 chapter book with 25 sonnets, 1 ballata, 4 canzoni written in 1295.